If it seems like a good many of the PDK games in the App Catalog are ports from iOS, well, that is the truth. The Plug-in Development Kit was designed to make it easy for developers to build C/C++ apps that run in webOS, and it just so happens (nudge nudge, wink wink) that most popular iOS games are built on C/C++. There are a few PDK games that are exclusive to webOS, and we’re about to get another. Launching first on webOS, with plans later for iOS and Android, is the new tube racing game Supersonic. Supersonic was released in beta form via the webOS Beta App feeds a few weeks ago and has received several feature updates since. The good folks at Kuuasema hooked us up with the public release version soon to hit the App Catalog, and we have to say that the game is more addictive than ever. The premise of Supersonic is fairly simple: you race down an ever-faster twisting tube lined with point multipliers and mines, all the while going faster and faster and struggling to avoid game-ending barriers placed throughout the unending course. 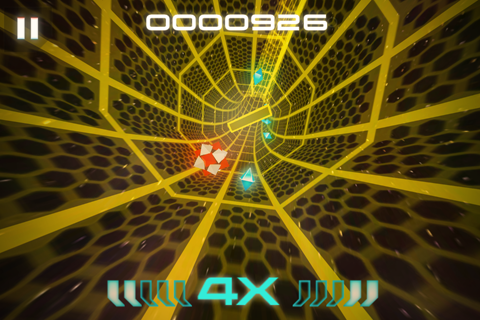 The entire game has a very Tron-like aesthetic, which suits it well given the futuristic concept (if implemented in reality) of the game. Gameplay is simple, yet addicting. You’re place in a first-person view in a randomly-generated semi-transparent tube that gently bends away in the distance. With a countdown you launch down the tube, tilting your phone to the left or right to move up and down the walls. Well, calling it “walls” isn’t really accurate, as there’s no up or down in Supersonic, there’s just where you are on the tube perimeter; your view rotates to match your position. As you move down the tube you can collect diamond-shaped point multipliers that increase the rate at which your score increases. There are also angry-looking red mines scattered across the course that will wipe out your accumulated multipliers (though not any points). This would seem simple enough if there weren’t also barriers in the way. The three-dimensional roadblocks come in bar, cross, half-circle, and three-quarter-circle varieties, and hitting them will end your game right fast. Thankfully, you can maneuver your way around them with the accelerometer-based controls, but you have to look out for mines right on the other side. Did I mention that all the while you’re racing down this tube you’re picking up more and more speed? It’s a simple concept, but the fact that the longer you go, the faster you go, and subsequently the harder the game becomes to play, makes Supersonic a game that is both captivating and a bit of a rush. The game knows this, and if you manage to score high enough it will even notify you of your rising place in the high scores bracket. No pressure. The “classic” tube racer is one of the two racing styles offered in Supersonic. The other is “blitz,” wherein you’re racing against the clock to collect credits that will enable you to buy upgrades (like impact-absorbing shields). To get to those credits you first have to collect enough diamond multipliers. It doesn’t take long, but there’s a catch: in blitz mode there are barriers, but instead of ending the game they wipe out your multiplier bank and force you to recollect before you can start collecting credits again. The entire game is wrapped in a cool minimalist neon space-type aesthetic that reminds us of the new Tron (in a good way). A set of sweet electronic themes background tunes keep you company the entire way, slowly picking up in intensity as the race goes on. It’s a smart move, making you feel more and more invested in the progress of your race. The sound effects in Supersonic are distinctive and full of dimension, really top-notch stuff. There’s just enough real-world familiarity in the way the game handles and sounds to keep it grounded, and that’s what helps make it so immersive. And addictive. It’s easy to lose several minutes, if not hours, to playing Supersonic in race after race after race. The exponential increase in difficulty the further you get into the game ensure that races don’t last too long, thus keeping your interest engaged. 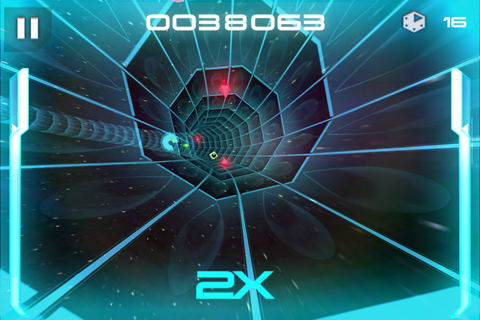 All-around, Supersonic is a smartly designed game, not to mention buckets of fun to play. Supersonic is available now in the App Catalog for $1.99.